For context, it is worth noting that the total population aged 16-24 has been declining in recent years; it was 22,000 lower than the previous quarter and 89,000 less than a year before. The number of young people in employment increased by 41,000 over the past year. The number who are economically inactive (not in or looking for work) decreased by almost 100,000. Figures are based on a survey so some of the reported changes may arise from survey error rather than ‘real’ changes in the levels. 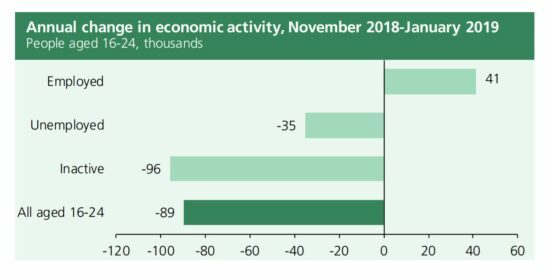 The unemployment rate (the proportion of the economically active population who are unemployed) for 16-24 year olds was 11.5% in November 2018 to January 2019. This is up slightly from 11.4% in the previous quarter, but down from 12.3% a year before. The inactivity rate for young people is 37.3%. Around three quarters of young people who are economically inactive are in full-time education. The youth unemployment rate was 11.5%, compared to an unemployment rate of 3.9% for the whole population. 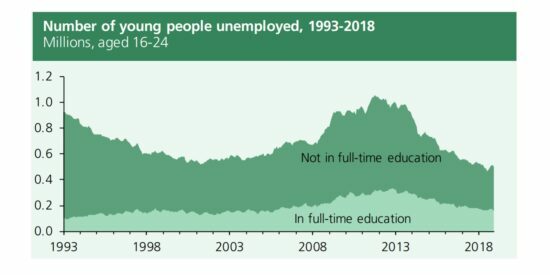 152,000 unemployed young people were in full-time education (30% of all unemployed young people) in November 2018 to January 2019, down 20,000 from the previous quarter and down 28,000 from a year before. Excluding those in full-time education, 348,000 people aged 16-24 were unemployed. This was up by 25,000 from the previous quarter but down slightly from the year before. The unemployment rate for 16-24 year olds in full-time education was 14.9%, down from 17.3% a year before. For those not in full-time education, the unemployment rate was 10.4%, down from 10.7% a year before. 30% of unemployed young people are in full-time education. 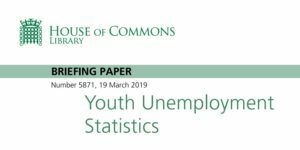 409,000 18-24 year olds were unemployed, while 1.61 million were economically inactive. 3.54 million were in work. The unemployment rate for people aged 18-24 was 10.4% in November 2018 to January 2019, down slightly from 10.5% a year before. 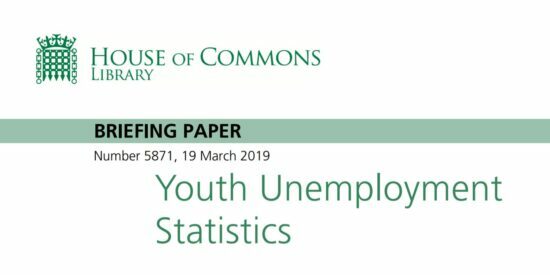 79,000 people aged 16-24 had been unemployed for over 12 months in November 2018 to January 2019. This was 16% of all unemployed 16-24 year olds. 298,000 men aged 16-24 were unemployed in November 2018 to January 2019, little changed from a year before. The unemployment rate for men of this age was 13.1%, the same level as a year before. 202,000 women aged 16-24 were unemployed, down 39,000 from a year before. The unemployment rate for women aged 16-24 was 9.7%, compared to 11.5% a year before. The fall in youth unemployment over the past year was almost entirely due to a fall for women. 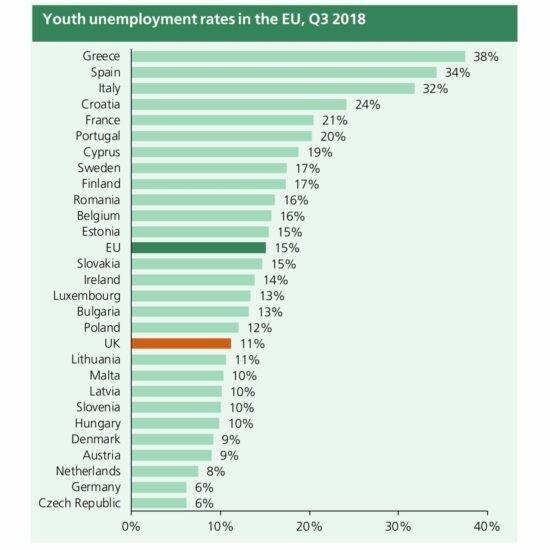 The chart below shows the youth unemployment rate across European Union countries. Figures are published by Eurostat (the EU’s statistical authority) and therefore may differ from what is published elsewhere in this briefing. Greece had the highest rate of youth unemployment in July-September 2018 at 37.5%. The Czech Republic and Germany had the lowest youth unemployment rate at 6.2%. The UK youth unemployment rate was 11.2%, compared to 15.1% for the European Union as a whole. Notes: Seasonally adjusted. Rate refers to the percentage of economically active young people aged 15-24 who are unemployed (16-24 year olds in UK, Italy and Spain). 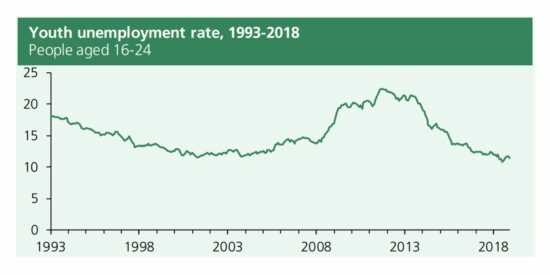 Since 2013, the youth unemployment rate has been on a downward trend in both the UK and for the EU as a whole, although it has fallen at a faster rate in the UK. 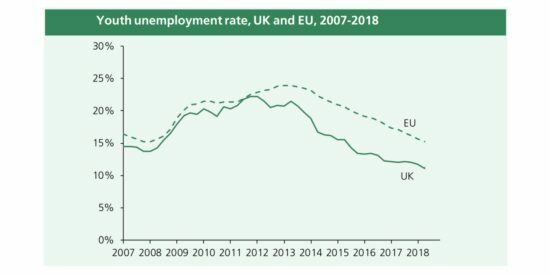 The youth unemployment rate fell by 9.5% points in the UK between July-September 2013 and July-September 2018, compared to a decrease of 8.6% for the EU. 1 All data are from ONS Labour Market Statistics bulletins and are seasonally adjusted. 2 The estimates for 16-17 year olds are more volatile than those for 18-24 year olds, since they are based on a smaller number of survey responses.